Its an oral nutritional supplement mainly used in poultry but also with positive results in other species. Improved formula: higher solubility and stability. Has been eliminated any component of easy degradation that may cause blocking in the water pipes or biofilm problems. It contains all the necessary amino acids, essential and nonessential, for the best development of the birds. All the amino acids are in levorotatory form, which confers a fast availability and high digestibility. The amounts of each amino acid are well-adjusted, without an excess, to be a perfect supplement to the diet at certain times of the production cycle of broilers, layers and breeder hens. Its completely soluble in order to achieve better application avoiding any problems in tanks and water pipes. Other products eventually precipitate and cause clogging problems in pipes. The formula avoids fast degradation compounds, which may cause clogging problems in pipes. The product performance is assured for a long period of time and it does not affect the quality of the drinking water. It adjusts to the needs of the birds following the concept of Ideal Protein, in order that the birds receive the necessary quantities of every amino acid, not more not less. Are you a commercial eggs producer? Are you a breeder hen producer? When PROMOTOR-L should be used? In the first week of life of the bird, whose digestive system is maturing, and requires the best nutrients. In situations of high nutritional demands or high production requirements, as a feed suplement. In stress situations after vaccinations. 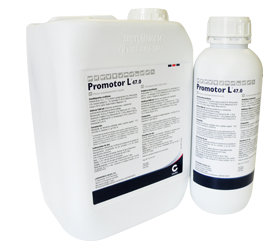 Nutrients provided by PROMOTOR-L not only help to avoid losses in production rates, but to increase them. In heat stress situations, the animal eats less, but cannot grow. L-amino acids has the maximum digestibility and are used much more efficiently. Do not generate metabolic heat in digestive processes, so while the animal is drinking, is incorporating the necessary amino acids for protein synthesis.